Set sail from Liverpool and uncover the stunning scenery of Norways North Cape plateau on this voyage to the land of the Midnight Sun, cruising through the awe-inspiring natural landscape you will experience Torghatten, the mountain with the hole, the spectacular Seven Sisters mountain range and the dramatic Lofoten Islands. Heading above the Arctic Circle, you will encounter Tromsos unique cathedral and the mysterious rock carvings of Altas indigenous people, the Sami. Discretionary gratuities to crew & guides etc on board or ashore. Please Note: In partnership with CITO Limited who is the principal for Fred Olsen Cruise Lines and therefore Jones Holidays are acting as agents. Fred Olsen reserve the right to levy fuel surcharges/fuel supplements at any time and we will advise any changes to the above prices as soon as we are aware. Prices are correct at time of going to print but may change at any time, call for latest prices. The Black Watch is the ultimate home from home at sea, spacious with a friendly, familiar feel and providing a traditional cruise experience. Refurbished at the end of 2016, the ship features stylish new decor, fittings and furniture, plus the new 'The Poolside' restaurant. What is more, new TVs, mini-bars and safes enhance the accommodation on board, boasting a 3D cinema too. Despite all these new features, Black Watch still retains her sleek, intimate style and has a welcoming ambience just like the rest of the Fred.Olsen fleet. Comfortable, stylish complete with smart TV, hairdryer, tea/coffee making facilities and individually controlled air conditioning. Irresistible choice of cuisine every day throughout your cruise  with 5 course a la carte dinners, casual breakfast and lunch buffets, late-night snacks and more. Shore excursions are not included in our packages. A shore tour information booklet will be sent to you by Fred.Olsen. 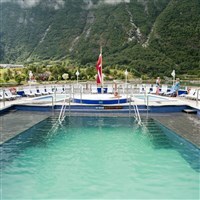 These can be booked directly with Fred.Olsen prior to departure or once on board (subject to availability). Naturally you may wish to explore at your own pace, however please do check visa & immigrations requirements for the port of call. Having suitable insurance cover is a mandatory requirement for your cruise, please ensure your policy covers ocean cruising. Fred.Olsen requires every passenger to have a passport with at least 6 months validity. Whilst Fred.Olsen warmly welcome guests with disabilities and/or reduced mobility it should be recognised that their fleet is not ideally suited to those fully reliant upon mobility aids or those unable to negotiate a stepped gangway. If you have any concerns regarding your suitability please discuss this with us before booking.